As collegiate men, the founders of Delta Psi Chi Fraternity, Inc. recognized the great importance of post-secondary education and immediately established Club Delta also on April 24, 1985. Club Delta is not a junior fraternity or sorority and was not established to guide young men into the organization. In fact, the Club Delta mentors have assisted former members in joining other Greek-letter societies whenever they chose to do so. 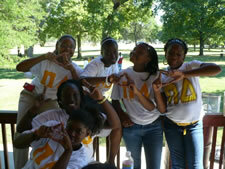 So what sets Club Delta apart from other mentoring programs? 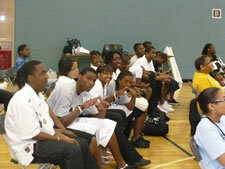 Club Delta mentors high school students in every sense of the word "mentor”. 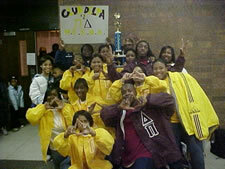 Not only does Club Delta focus on helping the students to achieve academically but Club Delta contributes to the personal, social, financial, and professional development of its members as well. While some mentoring programs only accept the “cream of the crop”, Club Delta is open to all high school students and motivates them all to live up to their full potential. "Our Education is Our Survival!" The purpose is to allow young high school men and women the opportunity to prepare themselves for the next level of education through discipline, responsibility, organization, brotherhood and sisterhood. Every mentor will draw off their own life experiences and knowledge to help ease the transition into college life and adulthood. 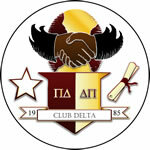 © 2011 Delta Psi Chi Fraternity. All Rights Reserved.